A bedroom inside one of Secret Harbor's homes in Burlington, Washington. Because of low reimbursement rates from the state, the foster care agency has closed about half of the beds in its group homes in the past decade, leaving it with just 12 today. Abused and neglected kids in Washington’s overwhelmed foster care system were housed at hotels and state offices at a higher rate than ever over the last year, newly released figures show — a practice that costs taxpayers millions and that experts say further traumatizes some of society’s most vulnerable. Faced with a severe shortage of foster homes and group treatment facilities willing to take children who have been removed from their parents, state officials say they had no choice. Meanwhile, for the first time, the practice of using hotels to house foster youth spread over the last year from the Puget Sound area to Eastern Washington. And, in another sign that the foster care system is floundering, the state increasingly ships foster children with serious mental health and behavioral problems to group homes in other states, where they are far away from relatives, lawyers and others who can monitor their well-being. About 100 foster children are now living outside Washington, more than double the number in past decades. These trends point to a child welfare system that is collapsing, observers say. “I think it’s more of a crisis than folks choose to realize,” said Brian Carroll, board president of the Washington Association for Children and Families, which represents private foster care agencies. 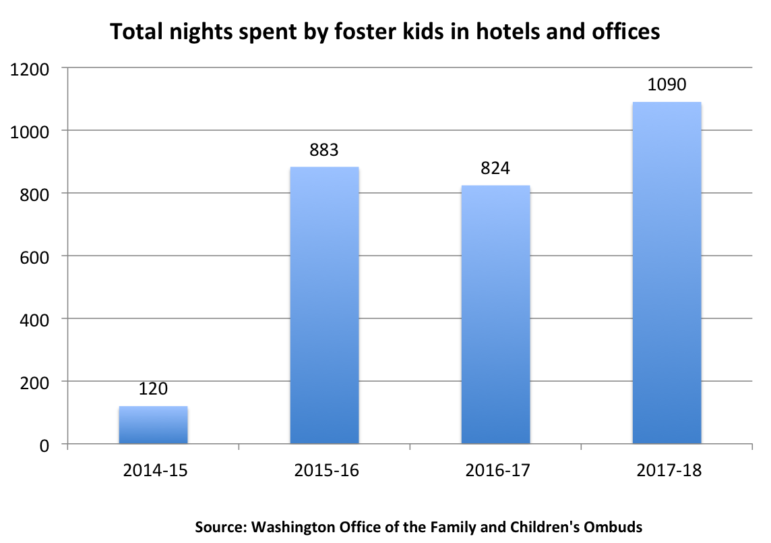 The new figures show that 195 foster children spent a combined 1,090 nights in hotels and state offices in the year ending Aug. 31 — the highest number of nights since state officials began regularly housing foster youth in hotels four years ago. At an average cost of more than $2,100 per night, hotel stays for foster children have cost taxpayers an estimated $6.1 million since 2015. The state has also spent untold millions more paying some foster parents up to $600 per child per night to function essentially as hotels, where social workers drop kids off in the evening, retrieve them in the morning and often babysit them all day in state offices. In Pierce County, where hotel stays have remained low, social workers say they have instead relied on such night-to-night placements, which the department is not required to track. The reasons for the current crisis are complex and long-standing, but the math is simple: The state is removing more children from their families than it has the capacity to adequately house. “Spending the night in a hotel or office, even just once, can be traumatizing for children who have experienced abuse and/or neglect, and creates unreasonable demands for Department staff,” the Ombuds wrote in a summary of hotel-stay data provided to InvestigateWest. Driven in part by the opiate-addiction crisis, that equation has only worsened in recent years. The number of children in foster care has increased nearly 23 percent since 2012, while the state has struggled to keep foster parents. At the same time, private agencies that contract with the state to run group homes for children with serious mental health and behavioral problems have sharply reduced their services, citing the state’s stagnant payment rates. State agencies, lawmakers and private groups have attempted some fixes, including efforts to recruit more foster parents, expand temporary emergency facilities and pay some private agencies more. Yet the “placement crisis,” as observers call it, lingers. Calling the situation “atrocious and unacceptable,” state Sen. David Frockt, a Seattle Democrat who has championed legislation to reform the foster care system, is calling for the department to look for ways to re-prioritize spending to keep kids out of hotels. “If it’s an emergency, treat it as such,” Frockt said. As adults look for solutions, kids continue to spend days, and even weeks, in hotels, creating more instability in their already-chaotic lives. One teenage girl, for example, spent a combined 67 nights in hotels last year, according to the Office of the Family and Children’s Ombuds, the state’s independent child welfare watchdog. The state reports spending more than $2,100 nightly for each hotel stay, on average, mostly for the salaries of one or two social workers, and sometimes also a security guard, to supervise the child. That’s about 3 1/2 times the base amount foster parents receive for an entire month, and the equivalent of more than a week in a group home with round-the-clock care. In many cases, the department uses hotels as a stopgap for a night or two when children are first removed from their parents, until caseworkers can find a foster home or relative. In the year ended Aug. 31, nearly half of children who stayed in a hotel spent only one night there before moving to a more permanent option, according to the Ombuds’ recent tally. In past decades, many of those children would have gone instead to the homes of foster parents who are paid extra to keep beds open and take children on short notice. But the department reduced those “receiving homes” after recession-era budget cuts that have yet to be fully restored. Children of color are disproportionately more likely to end up in hotels. Nearly 9 percent of all foster children are African-American, but black children made up 20 percent of those who spent time in hotels last year. One-third of children staying in hotels were under the age of 10. Repeated hotel and office stays also are violating foster children’s constitutional right to be protected from harm, Grimm argues. He helped win a 2004 class-action settlement requiring Washington to give foster children more stability. That case, known as Braam v. Washington, found that “children are harmed by being subjected to unnecessary multiple placements,” and that children were being placed in “unsafe” circumstances, including state offices. Court monitoring of moves under the settlement ended in 2011. The state resorts to these measures only when it has no other options, says Connie Lambert-Eckel, assistant secretary of child welfare field operations for the Department of Children, Youth and Families, which took over the state’s child welfare system in July. 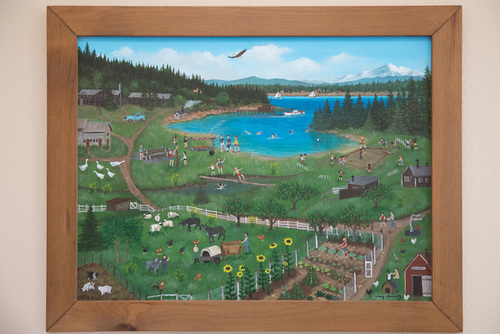 A painting of Secret Harbor’s former facility for foster youth on Cypress Island. It’s now transitioning to being a wildlife preserve for reasons unrelated to finances, but would have closed by now anyway because of low reimbursement rates from the state. Some of the recent increase in hotel stays was due to the temporary closure of two group homes in King and Pierce counties that take children for up to 30 days, Lambert-Eckel said. The facilities, which were shuttered from spring through July, house 24 children. In Eastern Washington, the state’s recent use of hotels was the result of one facility cutting the number of slots for high-needs foster children from 30 to just four. The system has so little wiggle room, Lambert-Eckel said, that the loss of even a few beds has dramatic consequences. The department is working to increase the number of such emergency placement facilities, including studying whether a facility for foster children could be built on the site of the former Pine Lodge women’s prison in Spokane County. While many children spend just a night or two in hotels, a small number cycle in and out of them for months. Just eight children between the ages of 9 and 16 spent a collective 371 nights in hotels over the course of several months, the Ombuds reported. Five of these children are African-American or multiracial, and at least five had spent time in group homes. Four ultimately were sent to out-of-state group homes. Many such children who repeatedly wind up in hotels, and nearly all of the those sent out of state, need specialized care for serious emotional and behavioral challenges. Their complex issues can include a combination of mental illness, developmental delays and behaviors such as self-harm, sexually inappropriate behaviors and fire-setting. But group homes and specially trained foster homes for such children are in short supply. The number of foster children receiving such intensive services, which the state calls Behavioral Rehabilitation Services, has dropped by about 40 percent since the recession, to roughly 600 children today. But more children need those services, and they sometimes wait up to two months for them, according to a 2016 report to the Legislature. Today’s shortage stems from cuts that began more than a decade ago, when foster care caseloads were falling and the state recognized that children often fare poorly in group homes, which are also extremely costly. At the same time, state reimbursement rates to private agencies providing Behavioral Rehabilitation Services stagnated. As a result, many agencies reduced the number of children they serve or closed altogether. 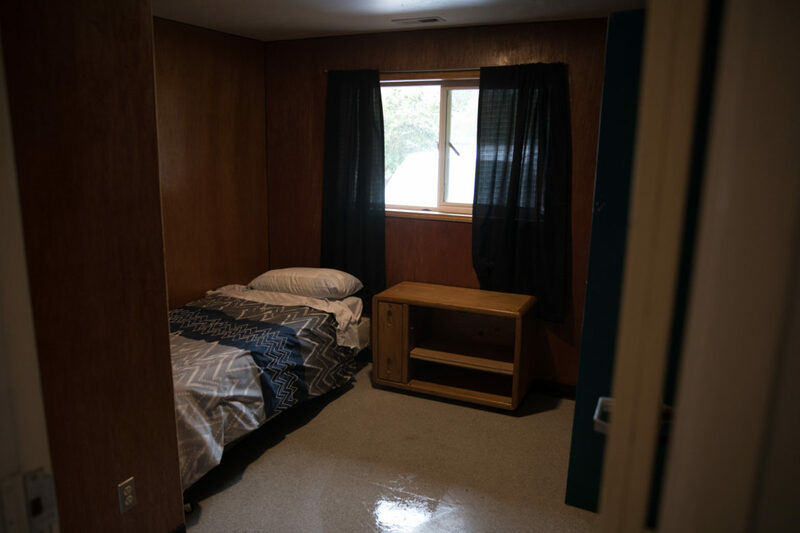 The department has approached agencies about increasing the number of beds in their facilities, but most have been “cool” to the state’s pleas, Lambert-Eckel said. “We ask them to take kids that are difficult to serve, and we have not appreciably changed the [reimbursement] rate of that service in a very, very long time,” she said. 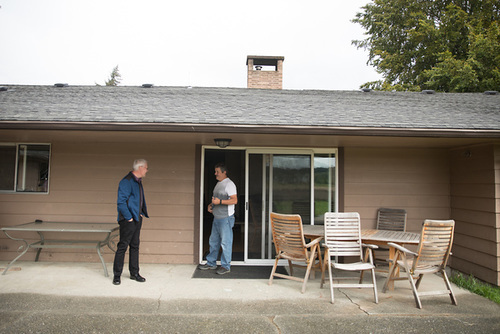 Secret Harbor President and CEO Brian Carroll and House Manager Frank Hasenbalg stand outside one of the organization’s homes in Burlington, Washington. Recent legislation sets the stage for significant increases to the budget for Behavioral Rehabilitation Services as early as next year. Lawmakers passed a bill (HB 2008) this year requiring the department to develop reimbursement rates that cover agencies’ full costs. The law also requires the Behavioral Rehabilitation Services budget to be set based on a forecast of the number of children who need those services, as the state does for most other social services. The Legislature stopped forecasting the BRS budget in 2009 as a cost-cutting measure. The recent legislation, while much needed, won’t improve the situation for children overnight, says Carroll, who is also president and CEO of Secret Harbor, a private foster care agency in Skagit County. His agency has closed about half of the beds in its group homes in the past decade, leaving it with just 12 today. Even with higher reimbursement rates, he said, it will take time for programs to build or reopen facilities, and to hire and train staff. 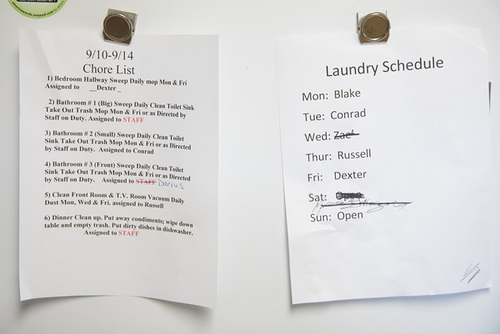 A chore list and laundry schedule for Secret Harbor foster home residents. Whether group homes should be rebuilt is a matter of debate, with some child welfare advocates arguing that children should always be placed in family settings, either with kin or with licensed foster parents. Carroll agrees that more high-needs foster children should receive services while living with parents, other relatives, or with highly trained and supported “therapeutic” foster parents. But, he said, facilities “can play a very helpful and important role” by stabilizing children in crisis. Now they tend to be a last resort when the state has run out of other options. “Right now, it’s what bed is available, as opposed to what program will best meet the needs of this particular young person,” Carroll said. If in-state group homes are often a placement of last resort, out-of-state group homes can be a placement of desperation. Advocates say they are especially worried about kids sent to other states, far away from the department’s oversight and the children’s own support networks. Lisa Kelly, an attorney who directs the Children and Youth Advocacy Clinic at the University of Washington Law School, has represented foster youths who have been sent as far away as Oklahoma and Michigan. A placement out of state “means not only do they not see their parents, they don’t see their siblings, they don’t see their aunt who was the one person who was good to them, they don’t see that teacher anymore who maybe saw something in them,” she said. Getting that advocacy is harder when youths can’t see their lawyer or court-appointed advocate, if they have one. The department also has a limited ability to monitor the quality of out-of-state programs and must rely on monthly reports from distant social workers. Some out-of-state placements are hard to avoid for specialized cases in which Washington simply does not have the right kind of care available, officials say. But with the right supports, many of these children could be brought home to live with a relative, Carroll says. Sometimes all a family member needs to meet state foster care standards is an apartment with another bedroom or a reliable car. “That’s a way better use of those dollars than putting them in a group home in Iowa,” Carroll said. His assessment was echoed in the Department of Children, Youth and Families’ budget request on Monday, in which Secretary Ross Hunter called for all such children to be returned to Washington within two years. Hunter also pointed out that the state risks losing a lot of federal money if it does not meet new requirements related to the quality of group homes. “This is bad,” Hunter wrote. Meeting the new federal requirements would mean the state would have to pay more to the private foster care agencies. Now the question is how the Legislature will respond. Robert McClure contributed to this report. Youths entrusted to Washington’s foster-care system have endured “abusive” practices in a jail-like Iowa group home that inappropriately used painful physical restraints on children, according to a new report by a government-designated watchdog group. The report, released today by the nonprofit Disability Rights Washington, documents numerous instances in which youths between the ages of 14 and 16 were held down by three or more workers. One child’s glasses were broken when staffers pushed the youth to the floor, and another was restrained for 45 minutes. DCYF is already a disaster. Where is the leadership? What total BS. Written by DSHS. Poor caseworkers… need more money… just more lies. Few sign up to be new foster parents, because most everyone in this State knows a bio-parent, foster parent, or foster child, that has been brutalized and abused at the hands of DSHS and the private agencies. Report on THAT and you’ll have a real story! Thanks for your comment. We are aware of the dynamic you are describing. We have covered that in the past at http://www.invw.org/2016/10/28/washington-states-troubled-foster-care-program-struggles-to-keep-a-key-group-foster-parents/. But this remains an issue and we remain interested.